About Five Little Monkeys | FiveLittleMonkeys.fun Livonia MI. Five Little Monkeys was formed by two families, John & Terry (and their three children), and Imad & Ila (and their two children) - thus the name Five Little Monkeys! We think like parents first and business owners second, and our mission is to provide customers with an even higher level of respect, consideration for safety, and responsiveness to requests that we demand for ourselves - and for our Five Little Monkeys! We are licensed by the State of Michigan, and fully insured, for bounce house rentals (and our other party rentals). This is a dedicated, full-time, professional operation - this is not a weekend job or side gig like many others - it's our focus, all day, all week, and all year! We strive to be active in the local community, as individuals and as a company. Individually, you may spot one of us volunteering at local school or church events or helping coach youth sports programs. On a company level, we look for a handful of fund-raising or community outreach events where we are happy to subsidize our inflatable rental rates. If you are putting together a local community event for a great cause, email us to see how we can help sponsor or subsidize the cost of our party rentals for your event! If we ever fall short, in any way, big or small, please call us at 833-5-LITTLE and ask to speak to one of the owners, or email us at owners@fivelittlemonkeys.fun! At least one employee overseeing every customer setup has been trained internally and certified by SIOTA (Safe Inflatable Operators Training Association) for the safe setup and operation of our bounce houses and other inflatable rentals. Unlike many competitors, we do not employee outside or contract staff to deliver, set up, or pick up our inflatable rentals, because we are able to better ensure a consistently high level of customer service. Our staff are expected to be uniformed, courteous, knowledgeable, and all-around good guys and gals! In addition to providing a detailed set of party rental operating instructions and safety recommendations, we strive to ensure every customer has access to ample training/Q&A to supplement the written information provided in the Rental Agreement, (i) before your event (by phone or email), (ii) in-person at the time of setup, and (iii) at any time during your rental, even after-hours, by calling 833-5-LITTLE and selecting extension 3 to reach our Active Rental Support department. We monitor the latest news and safety recommendations from industry leaders, including the Safe Inflatables Operators Training Association, ASTM (F2374-17 Feb-2018), the US Consumer Product Safety Commission (Amusement Ride Safety Bulletin Aug-2015), and government bodies in more heavily regulated states (e.g. Ohio, Pennsylvania). Examples that set us apart from our competitors are: strict anchoring policies, covered slide platforms, safer entrances/exits (with rails or tunnel entrances), ASTM-approved safety mats and the Watchdog Series 2 Blower Siren - free with every moonwalk and other ride-on/ride-in inflatable rental - and much more. Our entire inventory was purchased new for the 2019 rental season. That not only means shiny new bounce houses and other party rentals, it also means none of the unsafe older, legacy inflatable rental inventory that many people still carry. We set aside a significant portion of our revenues to be reinvested in our inventory every year, in order to maintain one of the newest inflatable rental selections in the industry, nationwide. Oh, and our suppliers are reputable, US-based companies, including multiple Michigan-based businesses - sure, it's more expensive, but we believe it's worth it! Call us obsessive, but we wouldn't want to rent anything that hasn't been properly cleaned BEFORE AND AFTER EVERY USE. 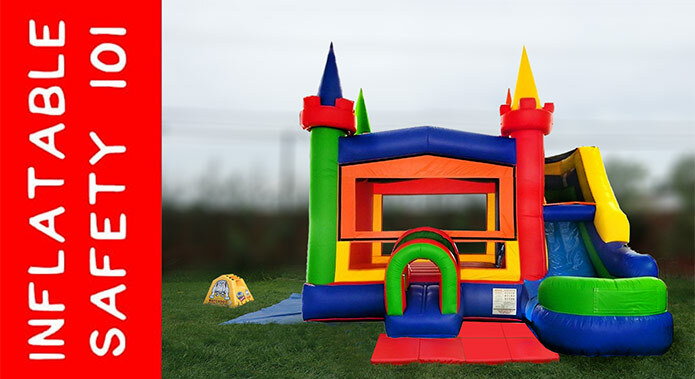 Not only are our bounce houses and other inflatable rentals spot-cleaned onsite, they are deep-cleaned in our dedicated warehouse, which is more than large enough to inflate all of our products indoors for a proper cleaning. We also soak, disinfect and scrub all of our concession machines after every use, which is not only important from a food safety perspective, but also ensures that your guests enjoy the fluffiest possible snow cones, cotton candy and popcorn. During our deep clean of all party rental items in our warehouse, we also closely inspect everything for damages and potential weak/failure points. We keep a detailed log of the repairs we make and never put a product out for rental if it has any unresolved issues - no shortcuts here! In addition, we deal only with reputable suppliers, to minimize the potential for failures or issues during your rental, because no one wants a breakdown during a party! But, if the unforeseen ever happens at any time during your rental, even after-hours, you can reach our Active Rental Support department 24/7 by calling 833-5-LITTLE and selecting extension 3.